Block Lotto On the Way! It’s been ages since I did something like this and it’s high time for some fun around here! The last time I hosted a block lotto was way back in January 2010 with Batiks on Black. Use coupon code TACKETT right here on Sewhooked and in my Etsy Shop for 25% off your total order during the month of August. This special coupon has been created as a fundraiser for my beloved and sick kitty, Tackett. Tackett is a regular visitor to Talk To Me Tuesday and even has his own Facebookpage. The great majority of the patterns I’ve designed have come into life with Tackett sitting in my lap or on my feet. Have you made patterns or projects from Sewhooked? I would love to see! Add them to the Sewhooked flickr group for a chance to be featured on my blog! 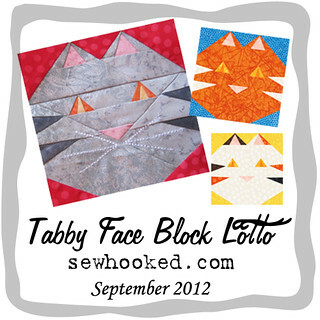 This entry was posted in Block Lotto and tagged Block Lotto on August 29, 2012 by Jennifer Ofenstein. I think it’s going to be a lot of fun. I had loads of fun last time I did something like this and I had waaay fewer readers then. The potential for lots of blocks is definitely there! I have to be in it, to win it. 🙂 I am so happy to hear Tackett is on the mend.